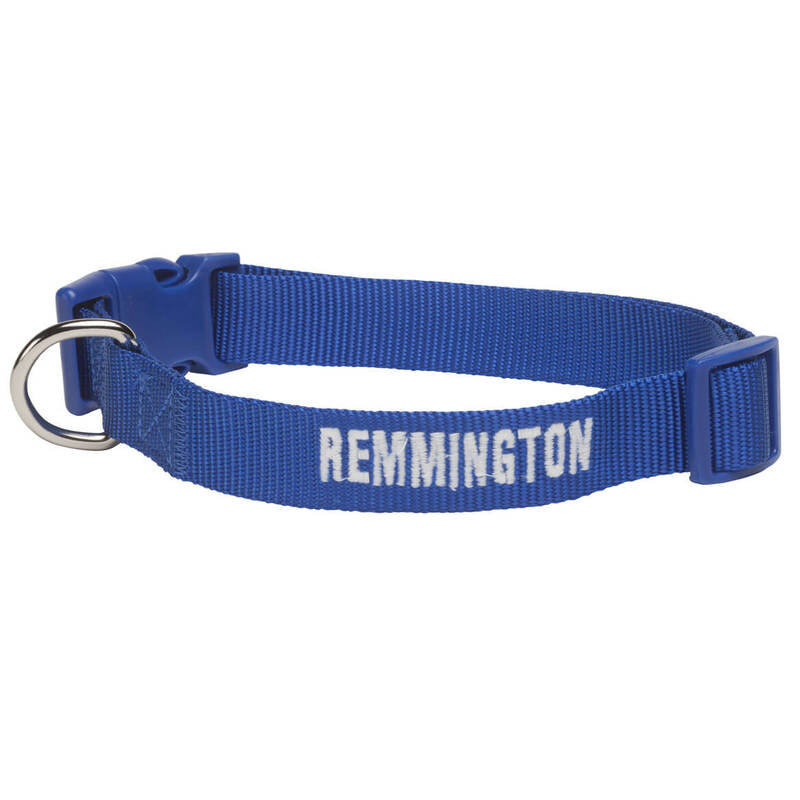 Personally naming your favorite walking partner, this personalized dog collar is dog-gone fun in five bright colors! 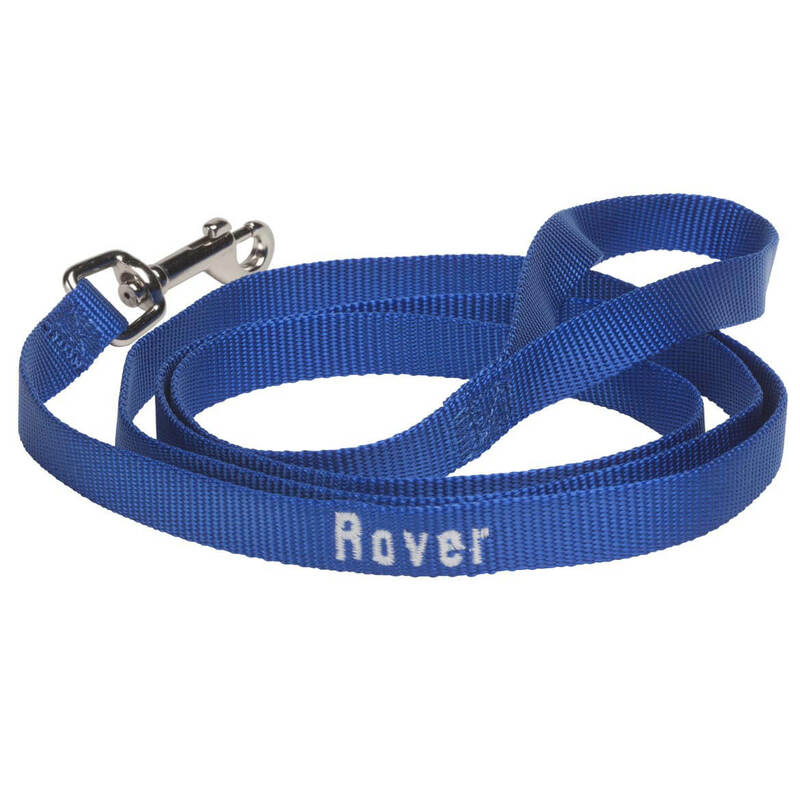 Made of sturdy nylon for lasting durability, the quality pet collar features a heavy-duty nickel-plated D-ring for secure lead attachment, plus quick-release plastic buckles for easy-on, easy-off. Dyed-to-match stitching gives each vibrant collar a uniform look. We’ll personalize this custom dog collar with your pet’s name, embroidered in white—creating a custom look for your pampered pooch! Specify color: pink, blue, purple, lime green or turquoise. Specify name; limit 1 line, 10 letters/spaces. 5/8″ wide embroidered collar adjusts to fit necks 14″–20″. Matching leash also available in all five bright colors (sold separately). 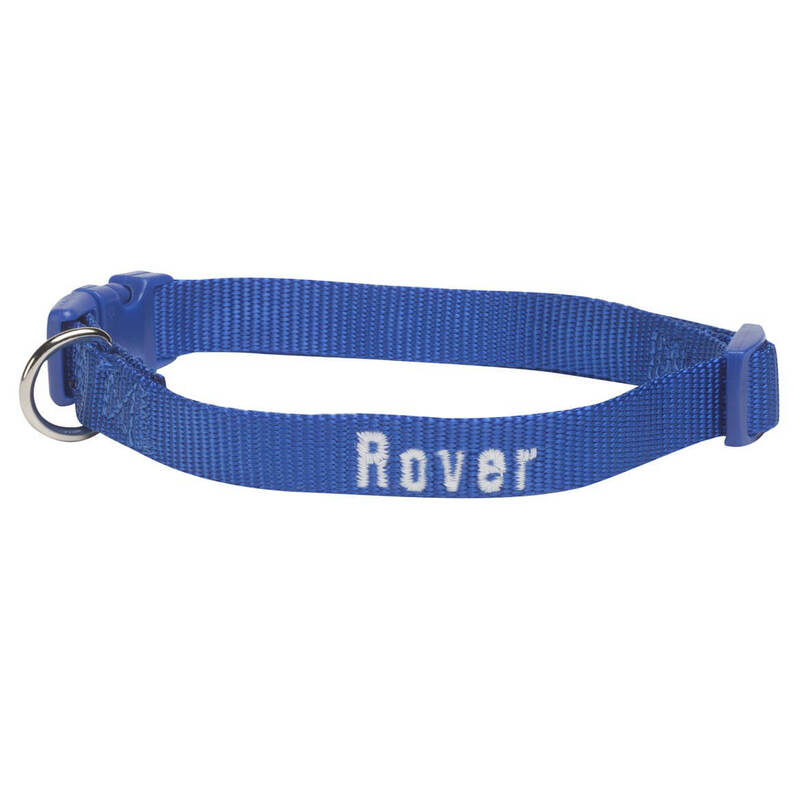 Giving personal shout-out to your favorite furry friend, this personalized dog collar is dog-gone fun in five bright colors! Designed in sturdy nylon for lasting durability, the quality pet collar features a heavy-duty nickel-plated D-ring for secure lead attachment, plus quick-release plastic buckles for easy-on, easy-off. Dyed-to-match stitching gives each vibrant collar a uniform look. We’ll personalize this custom dog collar with one special name, embroidered in white—creating a custom look for your stylish pup! Specify color: pink, blue, purple, lime green or turquoise. Specify name; limit 1 line, 10 letters/spaces. 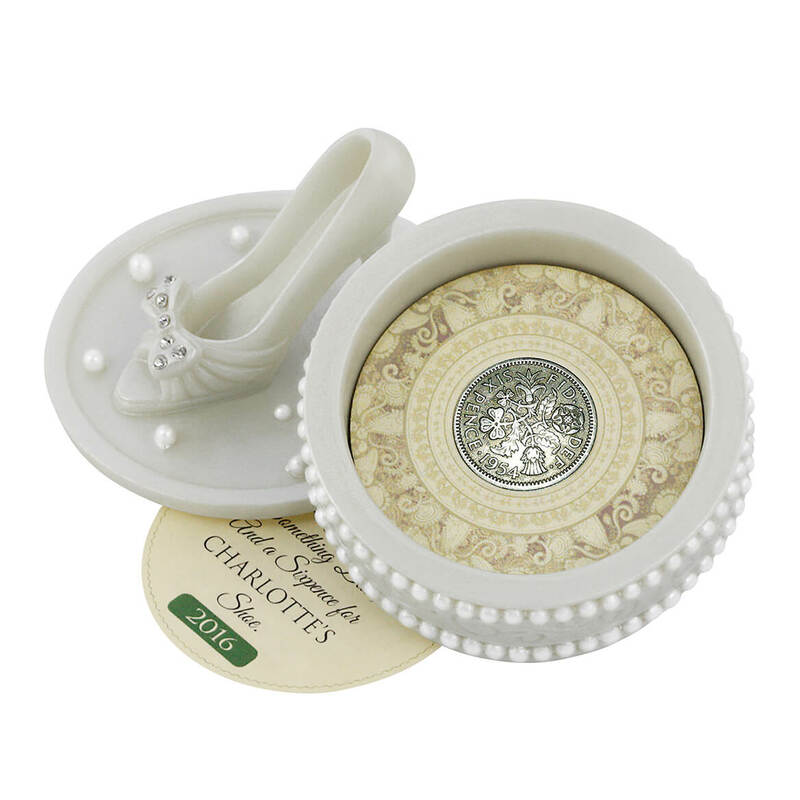 1″ wide embroidered collar adjusts to fit necks 18″–26″. Matching leash also available in all five bright colors (sold separately). Designed in the same bright colors as our Personalized Dog Collar (sold separately), this 4-foot personalized dog leash gives your stylish pet a complete, custom look! Made of durable nylon for long-lasting use, the quality dog lead features dyed-to-match stitching for a sleek, uniform look. 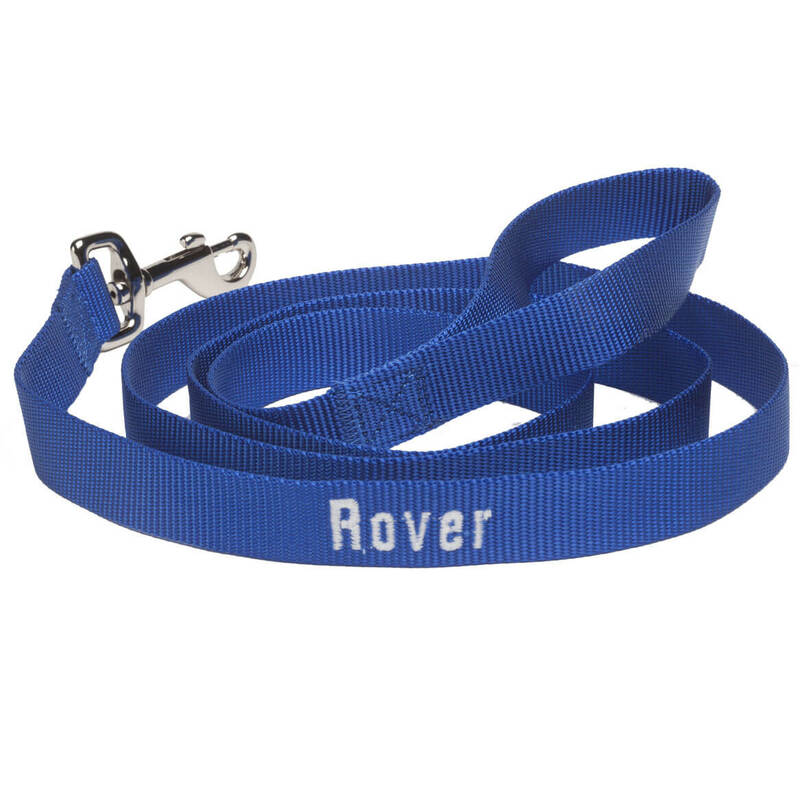 Heavy-duty nickel-plated swivel clip allows quick, secure attachment to collar. We’ll personalize with one special name, embroidered in white—creating a custom look for your stylish pup! Specify color: pink, blue, purple, lime green or turquoise. Specify name; limit 1 line, 10 letters/spaces. Nylon leash measures 4′ long x 5/8″ wide. Rockin’ the same bright colors as our Personalized Dog Collar (sold separately), this 6-foot personalized dog leash gives your pampered pooch a completely personalized look! Designed in premium nylon for lasting durability, the quality dog lead features dyed-to-match stitching for a sleek, uniform look. Heavy-duty nickel-plated swivel clip allows quick, secure attachment to collar. We’ll personalize with one special name, embroidered in white—creating a custom look for your stylish pup! Specify color: pink, blue, purple, lime green or turquoise. Specify name; limit 1 line, 10 letters/spaces. Nylon leash measures 6′ long x 1″ wide. Offered in the same vibrant colors as our Personalized Dog Collar (sold separately), this 6-foot personalized dog leash gives your best walking buddy a complete personalized look! Designed in durable nylon for long-lasting use, the quality design features dyed-to-match stitching for a sleek, uniform look. 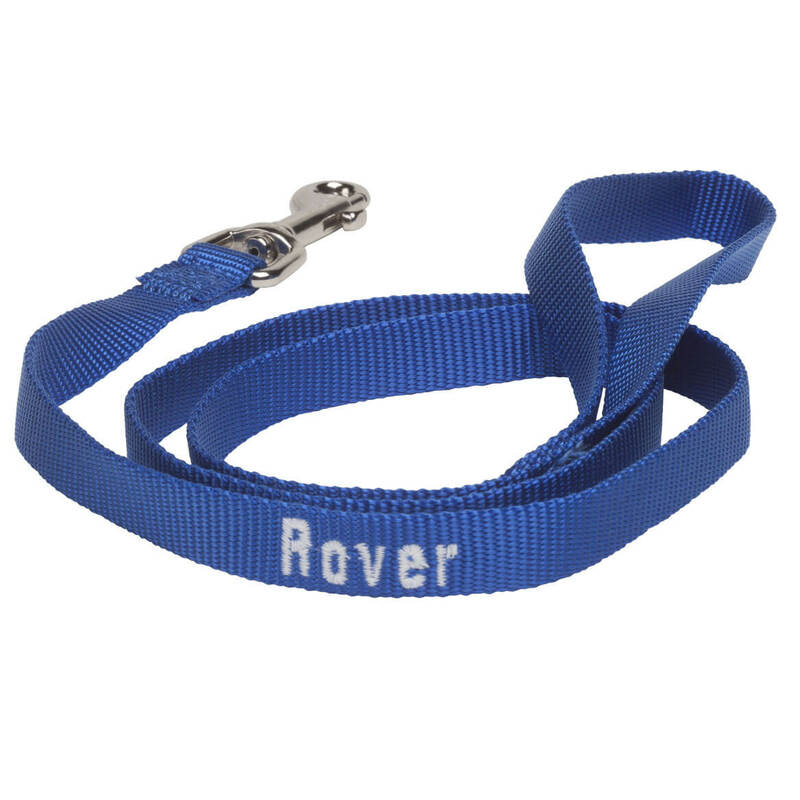 Heavy-duty nickel-plated swivel clip allows quick, secure attachment to collar. We’ll personalize with one special name, embroidered in white—creating a custom look for your stylish pup! Specify color: pink, blue, purple, lime green or turquoise. Specify name; limit 1 line, 10 letters/spaces. Nylon leash measures 6′ long x 5/8″ wide. 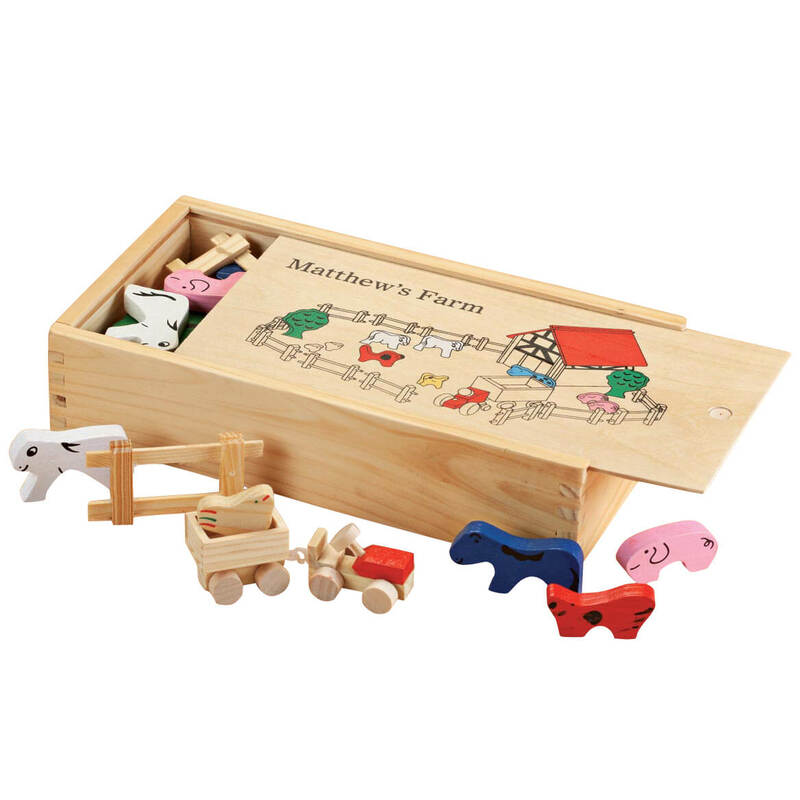 Offering simple, imaginative fun, this personalized children’s wooden farm set is a childhood treasure—especially when personalized for one little farmer! Beautifully crafted in solid wood, the toy farm set’s 28 pieces include all the essentials for country life, inspiring hours of creative play. The farm playset includes 2 trees, 10 animals, 1 tractor, 1 wagon, fence and farm building. When playtime ends, the entire set stores neatly inside its own wooden case, which we’ll personalize with one special name. Specify name; limit 1 line, 18 letters/spaces. “Farm” is standard. Farm building: 4″ long x 4 1/2″ wide x 4 1/2″ high. Case: 10 1/2″ long x 6″ wide x 2 1/4″ high. SMALL PARTS. Not for u003c 3 yrs. Welcome Baby with a priceless gift and get the little one started on the path to saving! 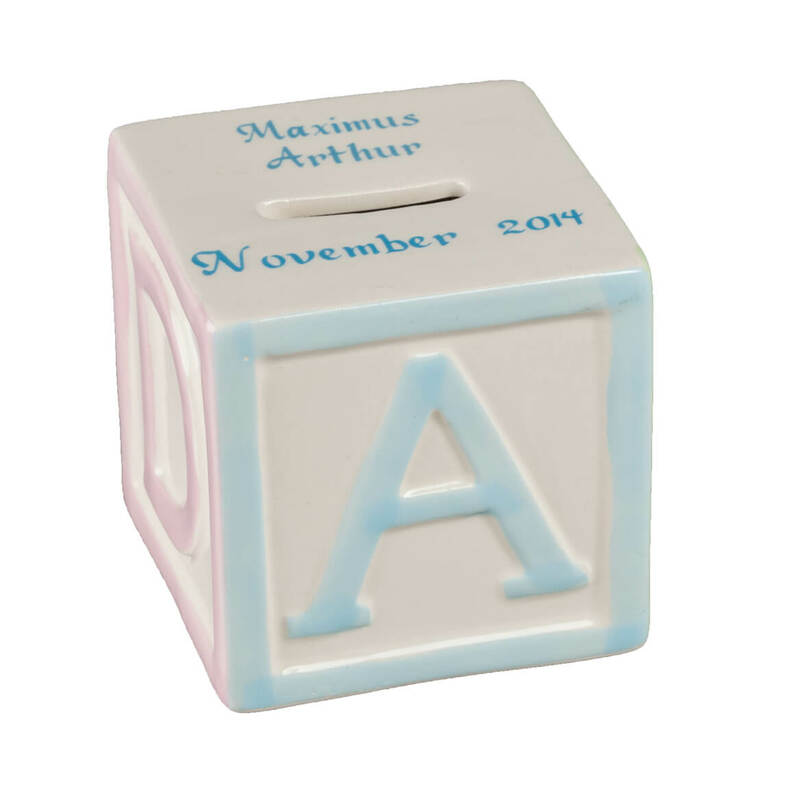 Ceramic personalized Alphabet Block Bank features A, B, C and D painted in pink and blue on all four sides; features coin slot on top and removable plastic stopper on bottom. We’ll personalize this kid’s coin bank with Baby’s first and middle name, plus birth date, earning a keepsake dividend at no extra charge. Specify first name, middle name and birthdate; limit 3 lines, 18 letters/spaces each. 3″ long x 3″ wide x 3″ high.